to read their bio and check out videos. 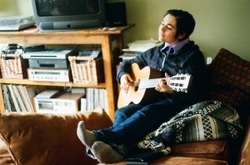 Rich's songs are upbeat, acoustic folk. He tells stories, gets people laughing, stomping, and singing. 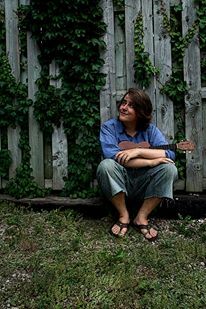 His songs are about everything, folk, story-telling, songs about people, about peoples struggles. And they're really fun. will be joining Richard on the stage! This Vancouver Island songbird has been winning hearts all over the globe! A packed tour schedule over the last two years has seen her performing in venues across Canada, Europe, The United Kingdom, and most recently Australia. 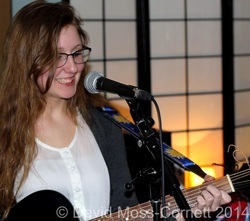 Grace Watson has her eye on a life of music when she finishes school, it's her dream job. She has just started to create her own music, and plays guitar, piano, ukulele, banjo, saxophone and a few more instruments. Grace has been playing coffee houses and gigs at school. She says her favourite music is mainly folky but with a modern spin, indie/folk, as she calls it. Grace is coming to play for us, to open the show for Richard Garvey. Safe ‘n Sound, a non-profit organization, provides safe emergency shelter and support for homeless people, in partnership with community services, and public education and advocacy for homelessness prevention in the City of Owen Sound, Ontario. A portion of the proceeds from this Mossy Gatherings show, featuring Richard Garvey, Marina Marina and Grace Watson, will go to support this most essential community service. I look forward to enjoying quality live music entertainment while supporting this important initiative with you. 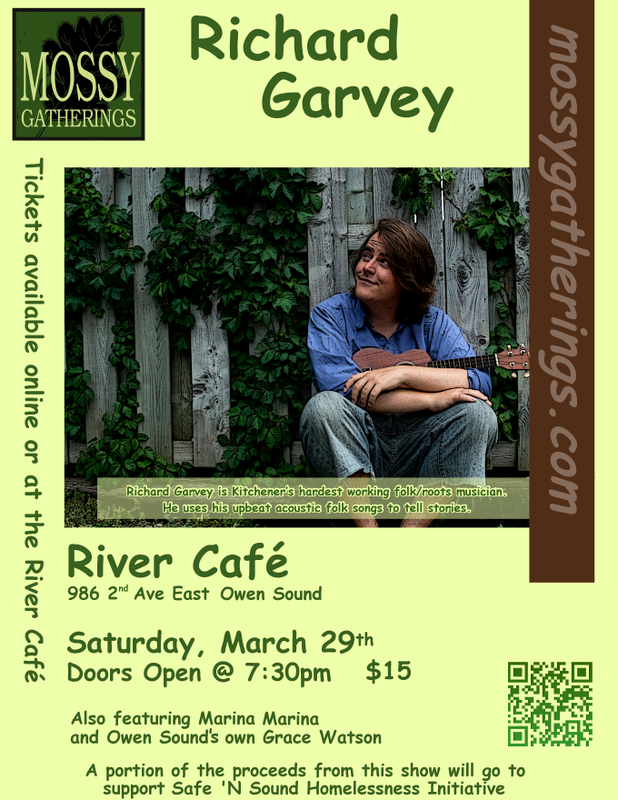 See you Saturday March 29th at The River Cafe. Doors open at 7:30pm. What inspired you to be a performer? "Friends. I wrote songs and sang at open mics, but what inspired me to perform and to share my music more was friends. When I was just finishing my undergrad I was invited to sing in 'the radical choir' which was mostly students. Lots of music students, lots of arts students, and I met good friends, and I found what I was really looking for. We we're basically a very informal choir that sang at protests/rallies/fundraisers and shared life together and made organizing political stuff a lot more fun. We don't practice formally anymore but i have some ideas brewing and long to get it going again? That experience really shaped me as a performer. I learned a lot about singing and started sharing songs, and figuring out how to write good ones for singing-a-long. and most of all, I just felt at home with these folks." "My biggest inspiration? Its tricky. Most of the music I listen to is by grassroots artists from my community or artists I've met through performing. I find most of it really inspiring. It's incredible to make friends with folks and see them grow as musicians/writers/performers. One of my biggest writing inspirations is Anthony Damiao. He's an incredible songwriter and we've had many many coffees at cafes in Waterloo sharing songs and ideas and that has inspired me. Other wise I love "old man luedecke, Amelia Curran, and david francey" to name a few national stars. I learned about Pete Seeger and his life and music about 4 years ago and started learning everything I could. Every where I went people would tell me I reminded them of Pete Seeger, getting people singing a long, telling stories, and all from a political stance of collective well-being and love. So I think in terms of the grand-er scale of the folk world "Pete Seeger" is the most inspirational." "I think "old man luedecke" just takes the cake on being consistently the music that feeds my soul." ﻿Do you listen to any music that your fans would find surprising? "I listen to lots. Hopefully not surprising; but hip hop like "shad", Glam-punk-cabaret amanda palmer... lots. just lots of music. I used to listen to more but i'm really hunkering down into being a folkie. maybe an angry folkie." What's the first song you remember really enjoying? "Probably early beatles. "drive my car". i don't have too many memories from childhood that stick out completely with music but occasional car rides with my mom. beatles, stones and cash were in the tape deck!" You travelled two Ontario tours on bicycle. How did that go over? "The first one with Polly in 2010 went a lot better. It was more well planned and more of a busking and exploring tour. With a few gigs on the way. My 2012 bike trip was a lot more intense. I brought an amp for my bar gigs, and it just weighed too much. By the time I got to Owen Sound, my hands we're destroyed and cancelled one show in Sauble. I got a lift to hanover where I just camped at my mom's for a week while playing a couple shows in the area. Its beautiful in huron/grey/bruce county, and I have a dream of making a network of house shows that artists could cycle between; while having lots of rest, inspiration, and networking with the incredible arts communities in the area and performing with them. Having a really good network of cafes/festivals/house concerts would set up the artist to succeed at performing and cycling. I feel this is coming in the future and bike touring will be something more feasible. But the last time really hurt my body from the weight of the trailer. Also I wasn't too well planned/connected so I ended up just camping illegally in parks and where-ever I could find a spot; which just led to not sleeping well. I did meet some amazing folks in Bayfield area on that tour, and hope to go back there. I've been thinking of buying a car for the last two years. It just seems so unsustainable and unaffordable, I don't know how I would make it work. But at the same time, I don't really know how to make performing work without owning a car." What's your best road story? So last spring I took a grey hound out to Squamish to hangout with John Farmer and play at the dancing bear music festival. It was pretty magical, but the best story was in Nelson. I stayed with my friend Brigitte who I had met on a train one time and didn't really remember. She said she would host me for a house concert in Nelson. When I got there she said we we're going to have the show in a little park nearby instead. We we're packing everything up to get the show going and it was just starting to get dark. I headed up towards the cars and everyone else started putting everything in the canoe. Everything being 4 people, 2 dogs, and everything you might need for a campfire concert. It was a magical evening, and people showed up from all over the world. It was just a romantic night of stories, songs, and then we packed it all up in the canoe at the end of the night and paddled home over the lake with a nice big full moon." ﻿You're soft-spoken in person, but outspoken in your lyrics. It's a bit juxtaposed. Is music your primary outlet for self-expression?/Is music a means of diplomacy for you? "Ok. I'm writing a novel! Yes. I get that a lot. I think its like a switch for me almost. I really enjoy performing. I like having people come a long for the ride. Other people do this by being really good a conversing or being super charismatic...I've been doing lots of personal reflecting in my life, and I think a lot of my soft-spoken and often silence was learned very early. I kind of disappeared as a kid. My family was rough, I moved like 7 times before high school, I never had long-term friendships growing up, or any really stable home-life other than my mom trying really hard. It just became a lot easier to be quiet, I guess, to try and not be noticed. I am sorting this through and writing about it lots. My own sense of worth, retelling my own story, and the story many need to hear that we are all innately worthy and loved... Friendship has become really important to me since finding a home/community in K/W. Struggling to maintain meaningful connections has been hard. Music has been a way for me to really express myself. I don't know who I would be with out it. I struggle with music being the main way I express myself. I often want to participate in more academic/philosophical conversations/debates but feel isolated because the main way I formulate my ideas and sort them out is through writing; but its not really a suitable way to converse in most circumstances. I'm working on open-communication and active listening as skills important for collaboration and relationships. I've been really evolving my writing and filtering less and trying to be more satirical and bitter and angry and sad and loving and really let out all emotions, more than worry about if what i'm saying is right or wrong or radically correct. I've realized its just more important for me to use music as a way to be expressing myself and connecting with others in honest ways than in perfect ways. My new EP/comic book is really about this. I think its the most honest I've been about how I've felt for quite a while. And I think the world needs people to stand up and say I'm confused about how to make community work and I'm tired of trying to do everything right. I just really need to feel connected and stop numbing myself when I'm angry and silencing myself when I'm isolated."